Left helpless, the affected states have started demanding amendments to the fca. About a year ago, Madhya Pradesh chief minister Digvijay Singh wrote to the prime minster requesting changes in the act. When the coordination committee of the Union home ministry met in April 2000, one of the main issues discussed was the amendment. Former Union minister of state for environment and forests and Jharkhand cm B abulal Marandi, supported this. However, the Union home minister has referred the matter to the mef. Except an informal acknowledgement, nothing has happened.Inside Chattisgarh's Indravati Tiger Reserve, 56 villages were served an eviction notice when the reserve was proposed as a national park. Protests from villagers didn't make much difference until the Naxalites intervened. "We had to change the map of the tiger reserve to exclude the villages from the reserve," says a forest official. "Naxalites have always used people's movement as a strategic way to mobilise people," says Kodandaram Reddy, a professor of political science in Nizam College, Hyderabad who has written a book on 30 years of Naxalite movement. The Naxalite movement has also gained ground due to protests against discrimination over non-timber forest produce (ntfp) and land rights. There are many ways tribal people are exploited: forest officials deny them access to forest areas, non-tribal people take over their lands through a torturous money lending process and traders cheat them while buying ntfp. This has left a large section of forest dwellers without any livelihood sources. "There is a deadly chasm between people and government. The Naxalites are cleverly exploiting this chasm," says Reddy. "While trade in ntfp is limited, timber remains a government source of revenue. This has led to an imbalance of power at the grassroots." Tendu leaf is a major source of income for the tribal residents for six months of the year. But curbs imposed by forest officials have spawned resentment. The Srikakulam uprising in the 1960s, which laid the foundation for the movement in the ap, was based on the rights of the local hill tribes over forests (see box: Looking back ). In Maharashtra too, the movement owes its origin to ntfp. Before 1980, the tribal people got as little as Rs 5 for 100 bundles of tendu leaf. But threats from Naxalites forced the government to increase the price -- it is now Rs 90. This made Naxalites popular: they made their way into Chandrapur and Gadchiroli. Now forest committees set up by Naxalites monitor the forest and its produce in these two districts. Likewise in ap Orissa and Chattisgarh, tendu leaf is used as an instrument for popular mobilisation.Two years ago in Chattisgarh, Naxalites set fire to the forest department's depot containing tendu leaf. 'Trials' were held and the 'guilty' officers were punished in the Jan Adalats (people's court). Now, the villagers get 60 paise per gaddi (pack of 50 leaves) as against the minimum support price of 45 paise fixed by the government. Villagers believe that the Naxalites ensured this. "Often the presence of Naxalites works as a social audit," says K Subba Rao, principal chief conservators of forests, ap. In ap, with the onset of the tendu season, a representative of the tendu leaf contractors enters the forest for 'talks' to bargain for the minimum price for tendu leaf. The bargain is always dictated by the Naxalites. It is no wonder that the price of the tendu leaf has increased from 7.5 paise for 50 leaves in 1986 to Rs 1 in 2001. Officially in ap it is 54 paise for 50 leaves, but in Naxalite-affected areas contractors give the 'additional' 46 paise. In Orissa's Koraput and Ganjam districts, Naxalites have spread due to stringent ntfp regulations. The case of bamboo is a fine example. Bamboo forests in these districts were leased to the paper mills and local residents became daily wage earners. Even then they end up earning just 50 per cent of the official minimum wage as forest officials collect a heavy booty from the contractors. "Naxalites now not only ensure the minimum wage, but also that it is paid regularly," says Anadi Sahu, Ganjam's representative in Lok Sabha. The pwg, in turn, collects Rs 5 everyday from the labourers to ensure a minimum wage. "The people earn more money and are spared of the hassles of government machinery," he says. "Wherever governance fails, Naxalites step in," says Sahu, also a member of the Union home ministry's parliamentary consultative committee. "In Bihar, the Naxalite movement entered in the wake of the 1967 famine. As governance collapsed, the people had less access to livelihood sources," says Bela Bhatia who has done a study on the movement for Cambridge University. Agrees Ram Prasad, director, Indian Institute of Forest Management, Bhopal: "The problem is to do with people's alienation from resources." Taking away tribal land just makes alienation complete and inteste. In all the affected states, land alienation among the tribal population is a major issue. In states like Chattisgarh, Jharkhand and ap, this has caused many rebellions starting from late 19th century to mid-20th century. After Independence also there has been a consistent effort to take away tribal lands even though the constitution guarantees rights over it. Starting from giving tribal lands for industries in Andhra Pradesh to the recent move to amend the Fifth Schedule provisions. These provisions give total control to the tribal people on their lands. Exploiting this situation, Naxalite groups like pwg recently started a campaign to pressurise the government for adhering to the Fifth Schedule. Eastern Ghats, a hot bed of Naxalites spreading over nine districts of Andhra Pradesh, for example, is no longer a safe haven for nearly 33 tribal communities, including seven primitive tribes, inhabiting these highlands. Since Independence, tribal people have steadily lost their hold over much of this area. While many have lost their sources of livelihood, others have sought refuge in deep forests. According to the 1991 census, the region's tribal-non-tribal ratio had dropped from 6:1 in 1950 to 2:1 in 2000. Due to various amendments made to the land transfer regulations in the tribal belt by the government, the non-tribal people are holding almost 55 per cent of tribal lands either benami or through clandestine means.In Bihar, upper caste landlords had snatched lands of poor farmers and monopolised common property resources like ponds and fisheries. "The alienation of land was so high that when the Naxalite movement started, there was never a single protest against violent attacks on the landlords," says Bhatia. Even now groups like mcc and pwg distribute lands to the poor and have ensured that dalits get fishing rights in village ponds. This has sustained the popularity of these groups despite massive retaliatory attacks from private armies of the landlords like the Ranvir Sena. Retaliatory attacks by Naxalites may have stopped landlords for occupying tribal lands, but now governments have taken the initiative. In 1989, the N T Rama Rao government had passed a resolution to denotify 314 villages from the list of areas earmarked for tribal people to legalise the benami holding of the non-tribal people. The resolution -- the third such attempt since 1965 -- was, however, rejected by the then state governor, Kumudben Joshi. In 1976 too, the then Congress chief minister, P V Narasimha Rao, moved a cabinet resolution to delete 123 villages in Warangal, Karimnagar and Khammam from the list. When environmentalists and ngos opposed such attempts, tribal people were harassed by the administration on the grounds that they were hand-in-glove with Naxalites belonging to the pwg. In its earlier stint (1985-89), the ntr g overnment had burnt down nearly 1,200 Khoya, Khond and Konda-Dora hamlets in the eastern Ghats for their suspected links with the pwg. The operation conducted by the then director general of police, P S Mohan Rao, affected nearly 60,000 tribal families. The displaced, resettled in plains, had to eke a living by working as farm labourers and many women were forced into prostitution to augment earnings. Is there a way to reverse the trend of the spread of Naxalites? The experience of 46 villages in east Goodavari district and a stronghold of pwg may have an answer. These villages managed to stop the Naxalites from entering their areas. Their weapon: a movement based on minor forest produces co-operatives. In 1998, when the Naxalites blasted the storehouse of the state's Girijan Cooperative Society that buys ntfps from the village cooperatives in Peddamallapuram village, the women came forward and spearheaded the anti-Naxalite movement. "Women are the worst suffers of deforestation and all the curbs on access to forests as they collect these ntfp," says Bodeti Lakshmi, a resident of the village. "Forest rights must be used as a weapon for tackling the problem," says Ravi Rebbapragada of Samata, a Hyderabad-based ngo, who has been a victim of Naxalite threats. 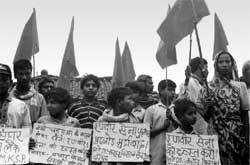 History has taught us that Naxalites wouldn't have spread had successive governments learnt from their mistakes: in all the worst affected states, there were massive people's movements for asserting their rights over forest and lands. Governments, instead of addressing the real issue, crushed these movements. As a result, when Naxalites stepped in, they faced little opposition from the people. Even when governments reacted positively to such an uprising, their commitment never lasted beyond a few years. In the Fourth Plan, area specific development schemes like small farmer's development agency, tribal development projects, forestry schemes were launched for the first time. But in the Ninth Plan, corruption and bureaucracy made such programmes ineffective. Forestry still remains a state monopoly. The Planning Commission in its observation of the Naxalites problem noted: "The forest departments in Naxalites-affected states do not seem to have any coherent policy." It cites the example of Bastar district where 55 per cent area has been declared as a forest. This has led to the spread of Naxalites. A meeting called by the Union home ministry on April 4, 2000 debated the possible causes of the spread and it was realised that the socio-economic factors were primarily alienating the people from the government and thus there was a need to go for major tribal welfare programmes. Though state governments were given financial assistance for police jobs, no real tribal welfare works have been taken up. Arvind Kumar, chief forest conservator of Jharkhand, warns, "An in-depth study of the forest policy and acts with corrective steps should be undertaken or there is a high risk of the movement spreading further."